The past weekend a friend of mine came home from Pennsylvania and he brought his Wii with him. I love video games, but have always felt the XBOX was the best system out there. Nintendo has gone in a different direction with the Wii, in that the graphics are not as good as XBOX and PS3, but their games are interactive and they appeal to a much larger audience that includes women. I have never seen any of my female friends so interested in playing a video game in my life. We played some tennis, boxing, bowling, Wario Ware: Smooth Moves, and Excite Truck and we all had a great time. Excite Truck is a great arcade style racing game! If you’re looking for the Grand Turismo or Fortza Motorsport or even Need for Speed type racing game you won’t find that here. It is much less about the handling of the car and more about simply beating your opponent to the finish line any way you can. Holding the Wii’s unique stick type controller parallel to the ground with your hands out in front of you, you steer the vehicle by “turning” the controller left or right like you would a steering wheel. The only button pressing is when you want to give your truck a boost. 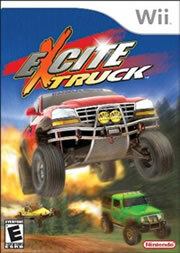 Like its predecessor, Excite Bike, if anyone remembers that game, you can fly farther by raising the nose of the truck. To do this with the Wii you would twist the controller back towards yourself. Different trucks have different capabilities. Some are faster, some have more handling and some can jump higher and longer. When I was playing I selected the dune buggy while my friend took the rugged pickup with lots of power. He took off right from the start, but lumbered over the jumps. I hit the jumps, twisted the controller back to get as much air as possible, and flew right by him. In the end I had just enough of a lead that he couldn’t catch me and won the race. It’s a lot of fun, there are a ton of options to choose from, and the Wii’s unique user interface sure makes gamming interesting for everyone.